The Fir features a three-car garage, 4 bedrooms, 3.5 baths, and a covered porch. With a total area of 4,135 square feet and a finished square footage of 2,855, this structure will serve as a lovely home for a big family. The combined living and dining room— the first room that will greet both guests and residents— let in a lot of natural light with its wide windows. The great room at the back features an island kitchen, nook, and family area with its own fireplace. The second floor of the home features the bedrooms, 2 shared baths, and the laundry area. 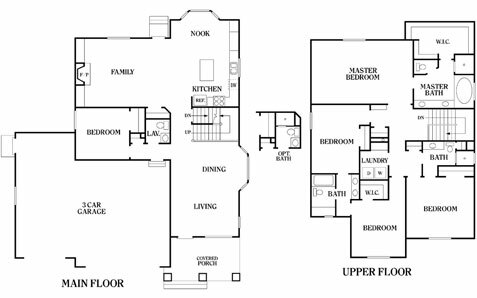 The master bedroom has its own walk-in closet and a spacious bath with a tub. Perry Homes Utah understands that buying and building a house can be a stressful affair, that’s why our company has made every effort to make the process easier. We offer financing options and excellent customer service. Our clients can expect the assistance of a design specialist who will walk them through every customization option available for the Fir. This way, they can make their home truly their own. Our company has over 40 years of experience in building heritage homes and family-friendly communities. Choose to build your future home with Perry Homes Utah and expect to live in a charming yet affordable house that will last for years. For inquiries about the Fir or any of our two-story and rambler homes, get in touch with us by calling 801-264-8800 or leaving a message on our Contact Us page.